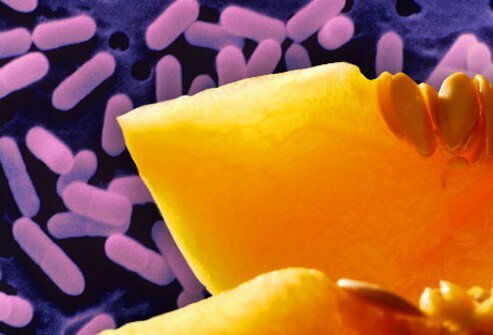 Listeria bacteria can contaminate fresh produce, like cantaloupes, as well as some processed foods, like cheeses. Symptoms of infection include fever, muscle aches, upset stomach, or diarrhea -- occurring 2 days to 2 months after exposure. 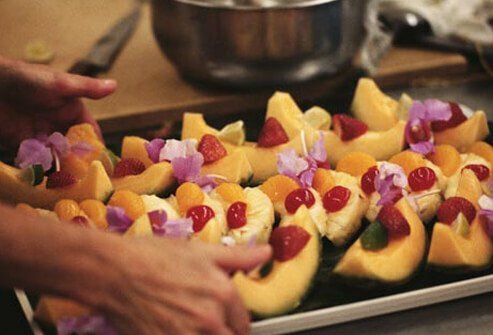 Safety: Scrub raw produce and dry before cutting. Store in fridge below 40 F. Clean everything in contact with a whole melon. 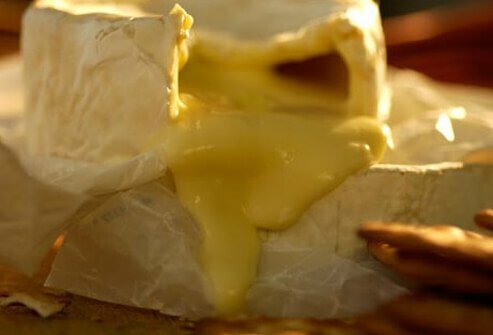 Dairy products made with raw milk, including yogurt and soft cheeses like Brie, feta, and Mexican queso, can harbor listeria. Because listeria can live at colder temperatures, simply refrigerating these foods won't kill the bacteria. People at highest risk of getting sick include the elderly, pregnant women, and people with weakened immune systems. Safety: Check the label. Make sure it's clearly marked "pasteurized." Sometimes listeria finds its way into a food processing factory, where it can live for years. 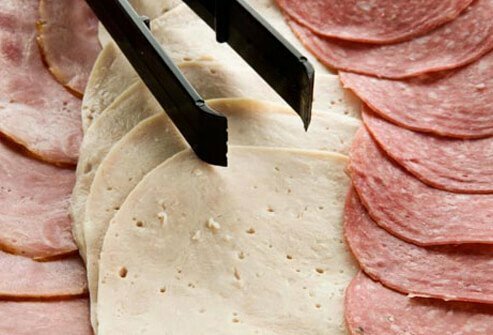 Heat kills listeria, but contamination may happen after cooking, but before packaging -- for example, if a food is placed back on a counter that had raw meat on it. Safety: Never keep pre-cooked or ready-to-eat foods past their use-by date. Heat hot dogs and lunch meats until steaming (165 F) before eating. Salmonella bacteria can taint any food, although there's a greater risk from animal products because of contact with animal feces. 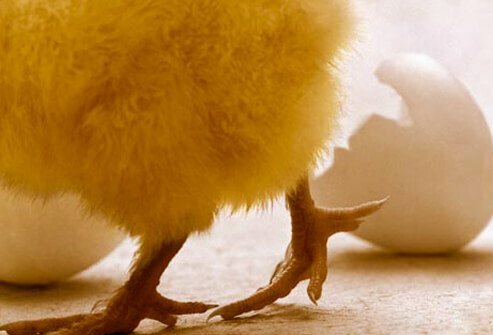 In chickens, it can infect eggs before the shell forms, so even clean, fresh eggs may harbor salmonella. Symptoms include stomach cramps, fever, and diarrhea 12 to 72 hours after exposure. Illness usually lasts 4 to 7 days. Safety: Never eat raw or lightly cooked eggs. Cook poultry to 165 F. Keep raw poultry separate from cooked poultry and other foods. Wash hands, cutting boards, utensils, and countertops after handling. Fresh produce is catching up with poultry as a cause of salmonella infections. Outbreaks have been traced to tomatoes, hot peppers, salad greens, and papayas. Sprouts, too, may harbor salmonella because they’re grown in warm, humid conditions – and are often eaten raw or lightly cooked. Infections can be severe or even fatal in people at higher risk, including babies and the frail elderly. Safety: Thoroughly wash and dry produce, and store in the fridge at 40° F.
Chips, crackers, soup, peanut butter, even frozen meals may pose a slight risk for salmonella infection. 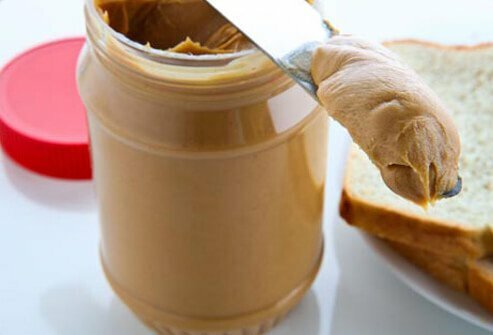 One salmonella outbreak was linked to peanut butter and packaged foods made with peanuts, including granola bars and cookies. In cases like these, salmonella bacteria at a processing plant can contaminate many products, which must then be recalled. Safety: Never use a product that has been recalled -- immediately return it to the store or throw it away. Heating foods thoroughly to 165° F can kill salmonella bacteria. 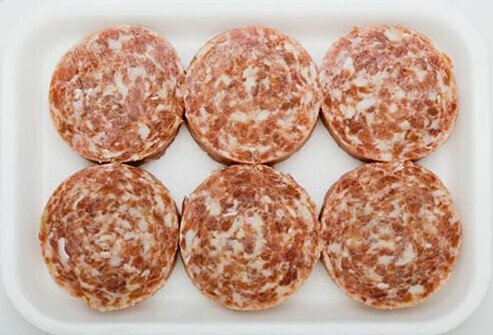 Raw meat, particularly ground meat, is at risk for salmonella contamination. Ground turkey has been linked with several salmonella outbreaks. You usually can't tell the food is contaminated because it looks and smells normal. Safety: Cook beef, pork, and lamb to at least 145 F and poultry (including ground poultry) to at least 165 F. Ground beef, pork, and lamb should be heated to 160 F. Avoid cross-contamination by washing hands and all surfaces with warm soapy water after contact with raw meat. 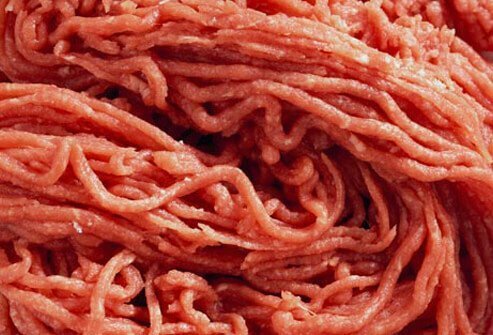 E. coli lives in the intestines of cattle and can contaminate beef during the slaughtering process. Ground beef is especially risky, because the bacteria can spread when meat is ground up. 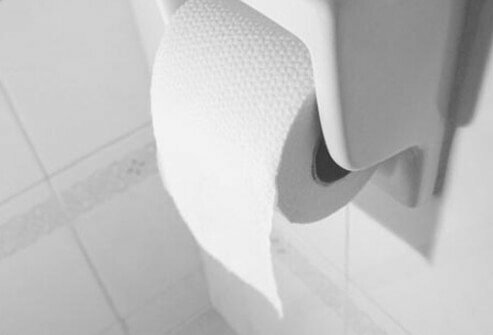 Symptoms of E. coli infection include severe abdominal cramps, watery diarrhea, and vomiting. The illness typically develops several days after exposure and can be severe in vulnerable people. It lasts about a week. Safety: Cook meat thoroughly (160 F, no pink in the center). Do not put a cooked burger back on a plate that held raw meat. Wash utensils, including the meat thermometer, with warm, soapy water. Pasteurization uses heat to kill bacteria. 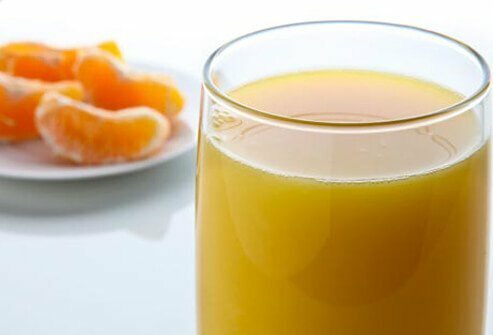 Since most juices you’ll find at the grocery store have been pasteurized, they pose no risk. However, unpasteurized juices and ciders sold at farms, stands, or in health food stores, can harbor E. coli. The bacteria can also get into raw milk as a result of unclean milking equipment, or manure-soiled or infected udders. Safety: Buy only products that have been pasteurized. If you're not sure, boil before drinking. Fruits and vegetables can be tainted with E. coli if the fertilizer or water used to grow them carries the bacteria. Leafy greens are at highest risk. 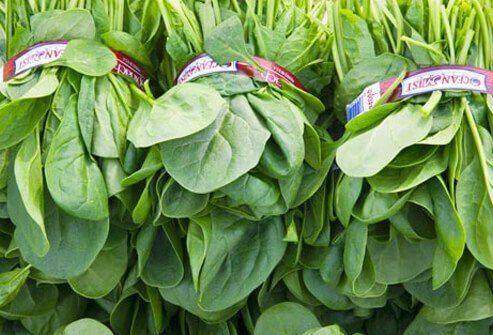 E. coli has been linked to fresh spinach. But produce growers have put safety measures into place to minimize the risk. Experts say the health benefits of eating fruits and veggies are far greater than the risk of food poisoning. Safety: Separate and individually wash the leaves of leafy greens, and cook vegetables to kill bacteria. Botulism is a rare, potentially fatal illness linked to improperly canned or preserved foods. 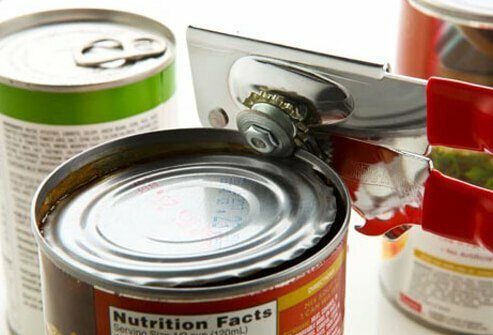 Home-canned foods are especially at risk, as well as honey, cured meats, and fermented, smoked, or salted fish. Babies have the highest risk of getting sick. Symptoms include cramps, vomiting, breathing problems, difficulty swallowing, double vision, and weakness or paralysis. If you suspect botulism poisoning, call 911. Safety: Never give honey to children under 12 months. Throw away bulging cans, leaking jars, or foul-smelling preserved foods -- or if liquid spurts out upon opening. Sterilize home-canned foods by cooking at 250 F for 30 minutes. Clostridium perfringens is a type of bacteria that causes cramps and diarrhea lasting less than 24 hours. 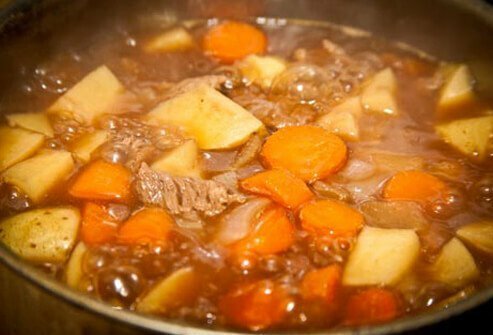 Stews, gravies, and other foods that are prepared in large quantities and kept warm for a long time before serving are a common source of C. perfringens infections. Safety: Sauces, gravies, and stews should be cooked thoroughly and then kept at a temperature above 140 F or below 41 F. Serve food hot right after cooking. Promptly refrigerate leftovers. Yes, you can get a staph infection from food -- when an infected person prepares it. 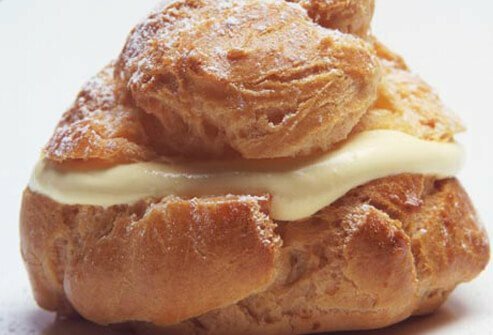 Foods at highest risk include sandwiches, salads (including egg, tuna, chicken, potato, and macaroni), cream-filled pastries, and puddings. Symptoms come on quickly, in as little as 30 minutes, and include vomiting, cramps, and diarrhea. The illness usually runs its course in one to three days. Safety: Wash hands thoroughly before handling food. 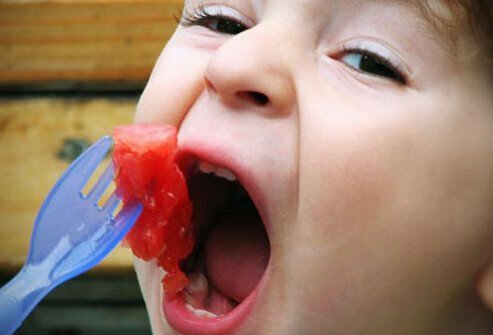 Do not handle food if you are sick or have a nose or eye infection, an open wound, or infection on your hands or wrists. Hepatitis A is a virus that attacks the liver and can cause fever, fatigue, nausea, weight loss, and jaundice. Most infections are mild. It can spread when an infected person doesn’t wash hands properly, then touches food or items that are put in the mouth. Recent outbreaks were traced back to workers in food processing plants or restaurants. Safety: Get vaccinated against hepatitis A. Check restaurant health ratings. Always wash hands thoroughly before handling food. 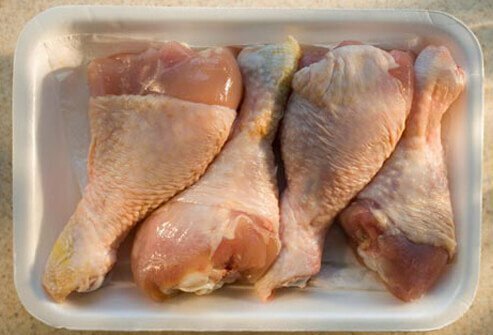 As little as one drop of raw chicken juice can cause campylobacter illness -- a little-known illness that is the second-leading cause of food poisoning in the U.S. Symptoms can include fever, cramps, diarrhea, and vomiting. Most people recover in less than a week, but it can lead to Guillain-Barre syndrome, a rare, serious illness. Guillain-Barre develops a few weeks after diarrheal illness and can cause temporary paralysis. 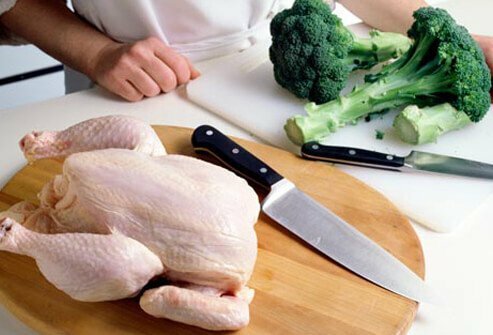 Safety: Avoid cross-contamination by washing hands, cutting surfaces, utensils, and countertops in warm, soapy water after handling raw poultry. Cook poultry to at least 165 F.
Noroviruses are the most common culprits in what we think of as the "stomach flu." They cause vomiting and diarrhea, and usually last 24 to 48 hours. 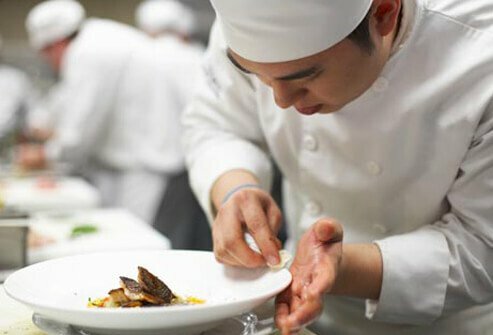 Norwalk viruses contaminate food when a food worker doesn’t wash his or her hands after using the restroom. Foods like salad or raw shellfish pose a risk because they aren’t cooked before eating. Safety: Always wash hands with hot, soapy water for 30 seconds after using the toilet or changing diapers, and before handling food. Vibrio vulnificus is a bacteria that lives in warm seawater and can contaminate shellfish, particularly oysters. V. vulnificus infection causes the same gastrointestinal symptoms as many other foodborne illnesses, but in people with weakened immune systems it can develop into a life-threatening blood infection. 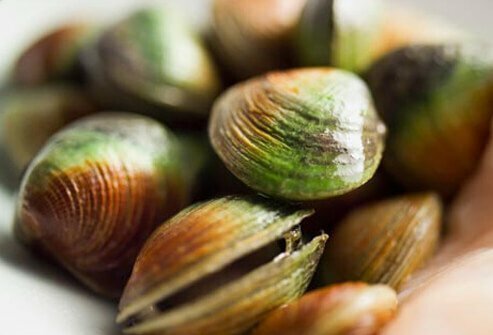 Safety: Only eat thoroughly cooked shellfish. Frying, baking, boiling, and steaming reduces the risk of infection. Throw away any shellfish that doesn't open during cooking. Paralytic shellfish poison (PSP) is produced by certain types of algae. When algae "blooms" -- called a red tide -- it produces high levels of toxin and shellfish can be contaminated. Symptoms of PSP include tingling lips and tongue, numbness, difficulty breathing, and eventual paralysis. Death from PSP can happen as soon as 30 minutes after extreme exposure. Luckily, PSP is extremely rare. 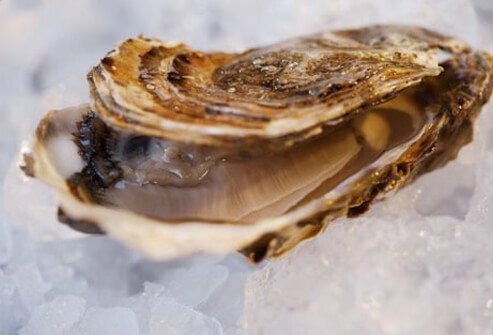 Shellfish are regularly tested for toxins before being sold to the public. Scombrotoxin poisoning is an allergy-like reaction to eating fish that has begun to spoil. 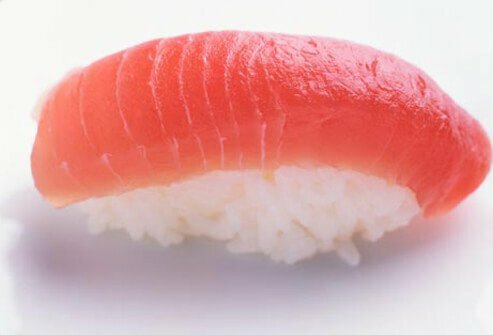 Fish associated with scombrotoxin include tuna, mackerel, amberjack, and mahi-mahi. 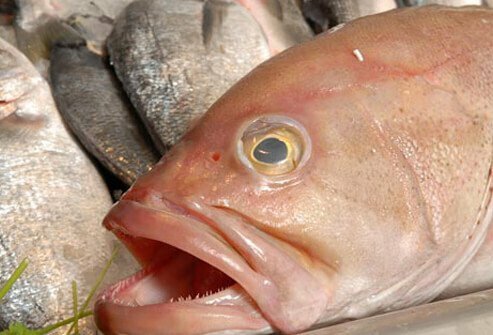 In the early stages of spoilage, bacteria produce histamines in the fish. 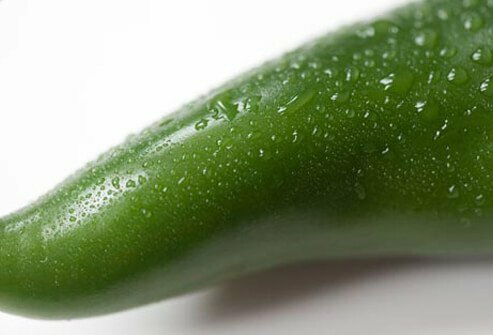 This causes a burning sensation in the mouth, itchy rash, dizziness, headache, and diarrhea. Symptoms usually subside within four to six hours, and antihistamines can help. There is no cure for ciguatera poisoning, and although it usually goes away after days or weeks, neurological symptoms can sometimes last for years. Thoroughly wash hands before handling food. Wash cutting surfaces, utensils, and countertops after contact with raw meat. Wash produce under running water and dry with paper towels. Discard outer leaves of lettuce or cabbage. Cook meat, poultry, and eggs to proper temperature. Certain groups are at increased risk of contracting a foodborne illness or getting very sick from it. Pregnant women, the elderly, young children, and people with compromised immune systems should avoid eating undercooked meats and eggs, unpasteurized dairy products, uncooked hot dogs and deli meats, and raw seafood. Illinois Department of Public Health. California Department of Food & Agriculture. Department of Health & Human Services, North Carolina. U.S. Department of Agriculture Food Safety and Inspection Service.